Welcome to my first ever Sunday Post! Why did I decide to participate on this meme? For me, it can be difficult to keep track of the books I receive and of all the posts I want to share with you when my schedule is chaotic (and as far as I can tell, my schedule will be chaotic for a very long time). So, in the middle of every month, I'll be participating on this meme to make sure I don't forget anything bookish I'd like to share and discuss. Of course, today, this will be a very short post because I'm very forgetful and disorganized. 🌻 Existential question: What is free time? Does it even exist? 🌻 Almost finished reading Hunted by Meagan Spooner. 🌻 Monsters are taking over my life (and that isn't a bad thing; I will later explain why). 🌻 FINALLY finished the first season of Blacklist. 🌻The House Cup Reading Challenge has finally began and I haven't finished a single book yet. I'm being an awful Gryffindor. 🌻 After debating a lot with myself and my bank account, I ordered V.E. Schwab's A Darker Shade of Magic Collector's Edition. A couple of weeks ago, I wrote a discussion post on reviewing ARCs where I talked about how sincere can a reader be when she/he is reviewing an ARC that a publisher or author send. I wrote my second The Nerdy Corner post. This time the nerd in me discussed nostalgia and video games. If you are interested, I'd love to read your opinion on which video games you would like to be brought back. So far this month, I've shared two Halloween Book Bingo related posts -Pokémon Halloween Book Tag and Book Monsters. Later today, a new post will be released. Don't forget to take a look at it. So far, only two books arrived at my doorstep. 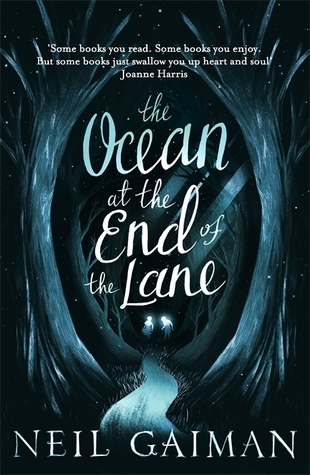 One of them was The Ocean at the End of the Lane by Neil Gaiman. The edition I bought was on sale on Book Depository. Last Friday, I received my special edition from Illumicrate of The Language of Thorns by Leigh Bardugo -I'll show you the unboxing but I'm waiting since I don't want to spoil anyone (you can still order The Grisha Edition box if you want to). I really liked that Neil Gaiman book. I hope you have a great week! The Language of Thorns is everywhere. I hope you enjoy all of your books. Happy reading! Thank you. <3 So far everyone has been so warm and welcoming that I may join the Sunday Post every week. I keep reading wonderful things about The Ocean at the End of the Lane that I just can't wait to have free time to pick it up. Lol, it's really difficult to write a review for a book that stole your heart. Welcome to the Sunday Post. I hope you'll enjoy it! I love the Sunday Post, and visiting all these lovely blogs. That Neil Gaiman book looks great. I'll have to check that one out. I agree, it's such a great way to list all the things that happened on the blog. That was one of the reasons why I started and I've been enjoying it so far. I'm really interested in your discussion post on reviewing ARCs - it's such a fine line. I have come to the conclusion that if I request books from authors I love the chances are high that I'll love or at least enjoy the requested book. If I didn't like it, I started letting the authors or publishers know, and I often don't even write a review. Most times it's me being in a book funk, and if that's the case I don't want to blame the author because it was clearly me being surly. Thank you for the warm welcoming. :) I thought it was an interesting theme to be discussed since reviewing ARCs can put a lot of pressure on the reader/blogger -I always fear my opinion may harm the publisher/author if it isn't positive, but at the same time I don't feel right not to point out the good and the bad of a book since I may be deceiving future readers. Well. welcome to the Sunday post! I like doing this post, because it forces me to at least sort of set a TBR for the week. Sometimes I read all the books, sometimes I don't, but it sort of gives me direction. I am a total fan of Spooner's Starbound series. I hope you like Hunted. Thank you. :) Although this time I didn't plan a TBR pile for the week, I will probably do it next time so I don't get lost in a sea of books. Also, it will certainly help me not to fall behind when it comes to the novels I have to review for the publisher/author. Happy to have you joining the Sunday Post, and it's a good way to stay organized and gives folks a chance to see what they might have missed. I am loving your mini haul..both covers rock. I like the idea about Nerdy Corner! I need to do something like that on my blog! Welcome to the Sunday Post! I like doing it to keep track of what people might have missed on my blog and also to give them hints of what's coming up soon. Looks like you had a great mini book haul this week. I'm dying to read The Language of Thorns and I really enjoyed The Ocean at the End of the Lane when I read it. Happy reading! Thank you Suzanne. :) It is indeed a great way to keep track of what people may have missed on a blog. I was very surprised to see that one of my discussion posts received many views/comments after I shared it on the Sunday Post. Welcome to the Sunday Post, hope you enjoy it. I know I do, I like to hear what everyone has been doing all week. Enjoy your books and have a great week! I hear you on free time - I can't figure out how people have time to be bored. Enjoy your new books! Hunted! I want to read that! And Language of Thorns. Definitely. I love Bardugo. Free time is not a real. It's just some folk tale invented to give us hope. =P I hope you have a chance to read Hunted because it's a beautiful story (my opinion can be biased since I usually love all the Beauty and the Beast retellings). Beautiful cover on THE LANGUAGE OF THORNS. 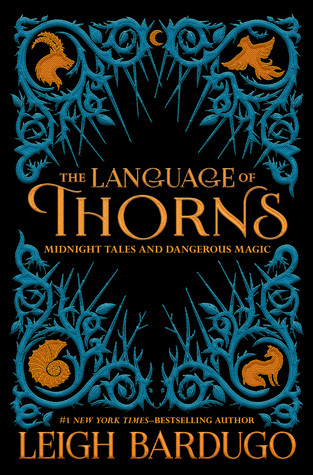 The cover of The Language of Thorns is very beautiful. I love all the details. The Language of Thorns is a beautiful book. I have not read it, but I've flipped through its pages and the illustrations are gorgeous. *. * I can't wait to read your opinion on Shadow and Bone. Everything Leigh Bardugo writes is insta love for me. Free time is certainly rare for me. I have enjoyed a couple of Neil Gaiman titles but haven't read this one. Glad to see you link at Sunday Post and Mailbox Monday. Hope to see you more often.